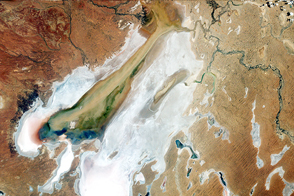 The Lake Eyre Basin in the interior of Australia is among the driest places on the continent. With less than 125 millimeters (5 inches) of rain falling in this area each year, the streams and creeks that drain into Lake Eyre—the lowest point in Australia—are usually bone dry, barren, and brown. Occasionally, the channels do fill after heavy downpours—and create a carpet of green. 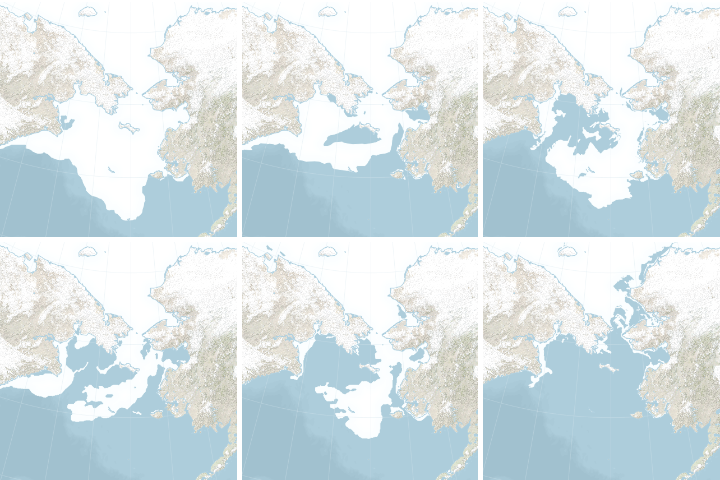 The Operational Land Imager (OLI) on Landsat 8 observed this transformation in a series of false-color images (bands 6-5-3) acquired between February 24 and April 25, 2018. With this band combination, flood water appears light blue. Vegetation is light green. The Diamantina River flows southwest from northern Queensland toward Lake Eyre in South Australia. 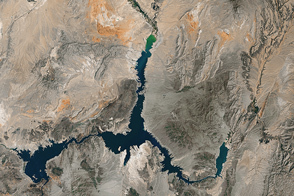 In February 2018, its channels were brown and parched. 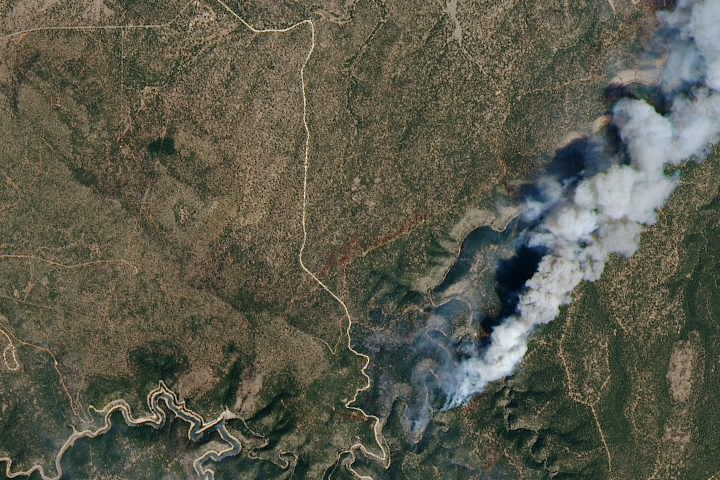 But after a series of storms in March 2018 dumped heavy rain in northern Queensland, water spread across its broad, braided river channels. By April, an expanse of green had emerged in the floodplain after the water receded. 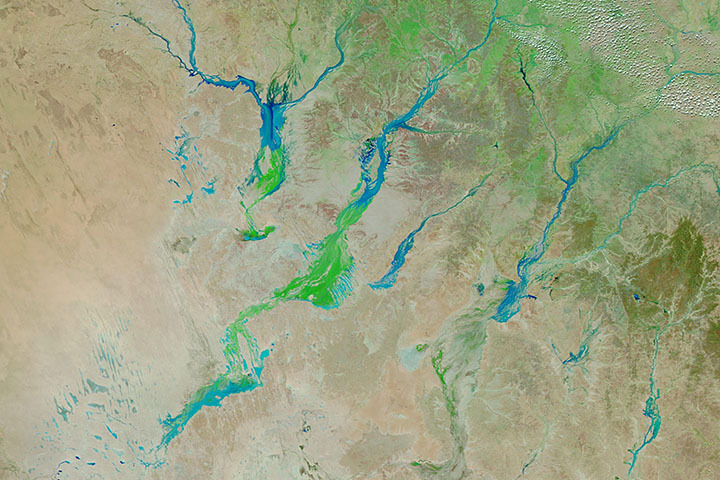 It is relatively common for the Diamantina River channel and other waterways that connect to Lake Eyre to go green. For instance, a major flood and greening event affected the basin in 2011. 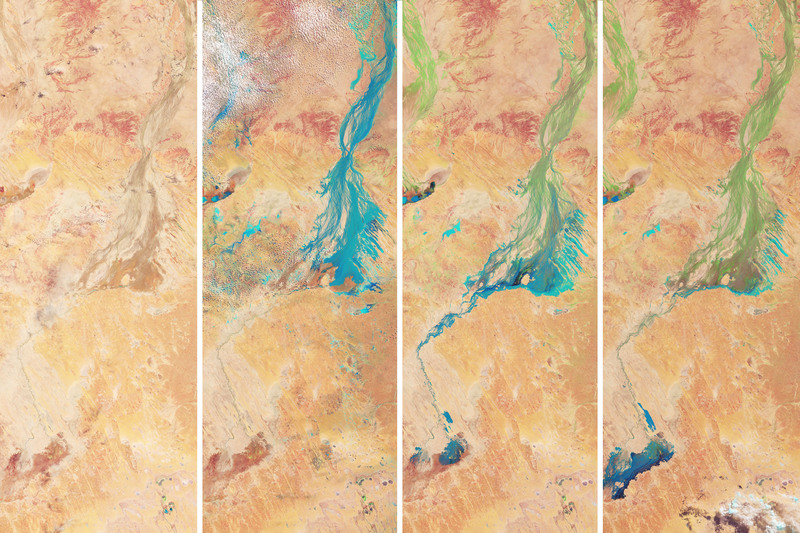 Typically, Lake Eyre fills up about once per decade, though the Diamantina River does deliver small amounts of water roughly every other year. Water from the current pulse of flooding has not yet advanced all the way to Lake Eyre, and there may not be enough water to make it there. Typically, most of the flood water is lost to evaporation and transpiration. In addition to providing opportunities for science, greening events offer locals a chance for recreation as well. “Some people make special trips to drive through the region or camp for a while, just to experience the flush of vegetation in the desert and all the wildlife—birds and insects, and some larger animals—that follow,” said Clarke. ABC News (2018, April 9) After a rainfall, where does all the water go? Accessed May 2, 2018. 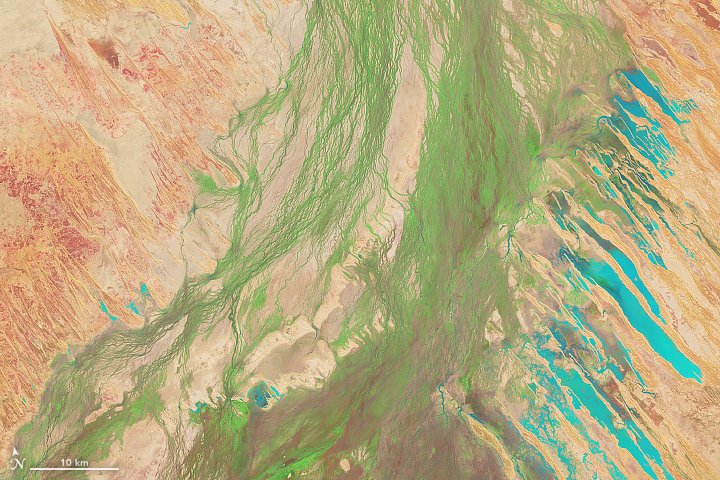 Australian Government Lake Eyre Basin. Accessed May 2, 2018. Bureau of Meteorology (2018, March) Lake Eyre Basin - March 2018 Summary. Accessed May 2, 2018. Bureau of Meteorology (2010) Lake Eyre Basin. Accessed May 2, 2018. Goyder Institute (2015) Spatial Indicators of Ecological Condition for Lake Eyre Basin. Accessed May 2, 2018. Flood water from northern Queensland drained toward a large basin in Australia’s interior—painting the desert landscape green.